My Friday Photos as just supposed to be photos, but they ARE supposed to be pictures of things that I want to share, but really don’t need or deserve a long written post. I didn’t want to share this picture without more information. Even though this is before cooking I didn’t NOT want to share this picture because that was one GREAT Frittata. I use this basic Frittata recipe (click here) and put whatever ingredients I have on hand. This one pictured had leeks, mushroom, and sausage. Yum. I don’t have a cast iron skillet or a stove pan that can go in the oven so I just use a casserole dish. Frittata for today’s Friday Photo. This entry was posted on November 9, 2018 at 6:56 pm	and is filed under Friday Photo. Tagged: Friday Photo, frittata, frittata for brunch, leeks, Sausage, yummy breakfast, yummy dinner. You can follow any responses to this entry through the RSS 2.0 feed. You can leave a response, or trackback from your own site. That hashbrown idea sounds yummy. I think I have recipes for things like that, but I have yet to do it. I never have hashbrowns on hand, but I always have eggs – and like I have said, I use my frittata recipe as a “catch all” – whatever is in the fridge goes into it! Although, we have had our share of “egg casseroles” for a bit. We were at a bed and breakfast recently and that is all they served for breakfast. Done with that for awhile – especially because before we left we were eating on a frittata for three days!!!! UGH. 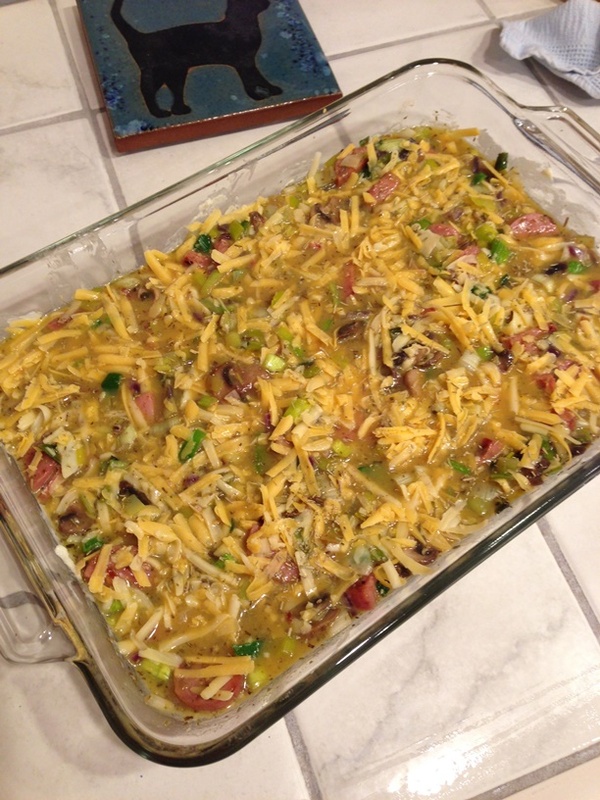 “Egg casseroles” for eight days in a row!! !